Me in front of Audrey Hepburn's house in Arnhem.. 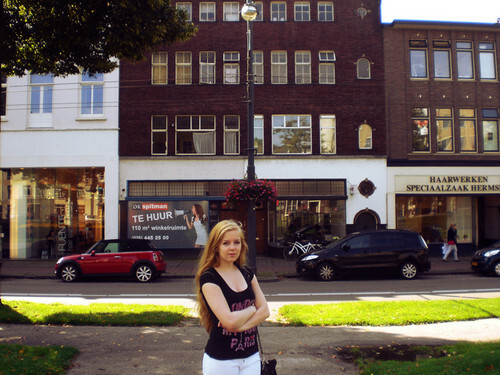 I've been to Arnhem last summer and I visited the place where Audrey lived during the war. When I walked there I just could feel the spirit. It was like she could walk out any moment.. HD Wallpaper and background images in the 오드리 헵번 club tagged: audrey hepburn actress arnhem photos. This 오드리 헵번 photo contains 거리, 도시 현장, 도시의 설정, 도시 장면, 도시 설정, 도시 거리, 도시 장면 설정, 갈색 사암, 사암, 행 하우스, 타운 하우스, 행 주택, and 행 집. There might also be 맨 손으로 다리, 팬티 스타킹, 몸에 꼭 맞는 바지, 몸에 꼭 맞는, 맨발 다리, skintight 바지, skintight, 맨 다리, 양말, 호스, 비즈니스 지구, 다운 타운, and 도심지. I indeed ám lucky. ;P I just live 20 minutes away from that place. If you ever have the chance to visit Europe, than you should go to Arnhem. There's also a bust of Audrey Hepburn. It's amazing! SAME!!! :O i wish i lived in Europe!!!!!!! !